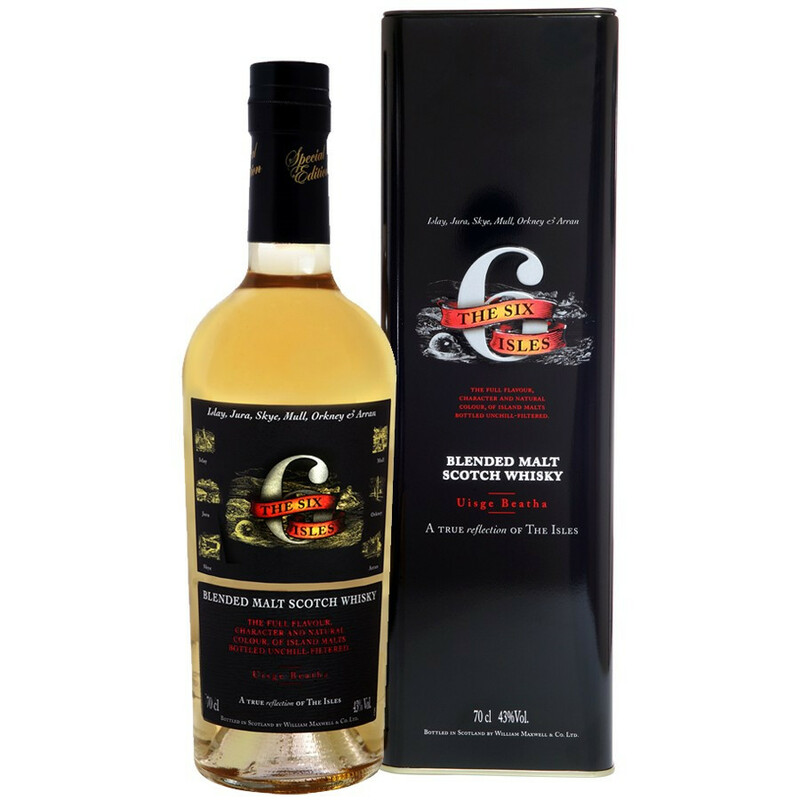 The Six Isles is the very first expression to combine malts from the six whisky producing islands of Scotland. Scotland has some 140 populated islands, within which only 6 produce Single Malt whisky today: Islay (peated and iodized whisky), Jura, Skye (spicy, peppery whisky), Mull (salted and iodized whisky), Orkney (with rich, distinctive notes) and Arran. The Six Isles is the very first Pure Malt whisky combining the best malts from carefully selected casks, coming from distilleries located on the six whisky producing islands. This expression has been crafted by the Ian Macleod Distillers Limited team. All the vivid character of these islands can be found in this dram, from peaty and smoky notes of Islay, softened by floral aromas of heather and sweet hints of honeyed iodine picked on Orkney Islands, to the other very characterful and flavoursome presence of the four other Isles. It is a journey of the senses through the best Island Scotch whiskies. 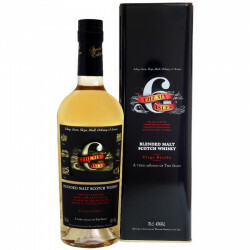 This is quite a sophisticated blend, with a very maritime nose, lifted by peaty, smoky and iodine notes. In the backdrop, lovely floral and fruity flavours of grapefruit and lemon lift the overall spirit and then evolves on vanilla flavours. The mouthfeel is rather dry, a dash of water unleashes a world of aromas. 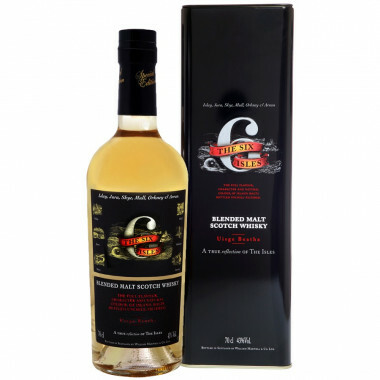 The Six Isles Pure Malt whisky is a bewitching blend that will delight the experts. Ian MacLeod Distillers Ltd is one of the biggest family-run businesses within the spirits industry. The Scottish company offers a large range of spirits. Leonard J Russell, founder of the company, always firmly believed in the value of independence and not owing anybody. As a distiller, he purchased only the whiskies fulfilling his quality requirements and his clients’ and met success. In a few years, his company became quite famous and recognized in the Scotch whisky trade. Ian MacLeod Distillers Ltd is the owner of Glengoyne and Tamdhu (Speyside) Scotch whiskies, Isle of Skye Blended whisky, Hedges & Butler, King Robert II, London Colline Gin Dun Bheagan Ranges, Smokehead, Six Isles Blended Malt, MacLeod… The company sells around 15 million bottles of spirit a year. Nose: a great complexity of spices, pepper, smoky notes and tangy sweets, iodine and floral aromas of spring heather. Palate: rich, sweet and oily, with an edge of freshly cut wood and citrus fruits, coated in light peat. Finish: sweet and salty, a gorgous, subtle finale.